Today I've tried the tolymoly super peel booties - last time I tried their normal ones. These must be kinda strong because they bleached the colour out of my bright pink toenails to a pale pink lol. I really liked the original, but hope the super strength ones give me baby feet. Gonna check out the holika holika moisturizing booties for my hubby. He really liked the one that came in memebox 6 I think it was. Has anyone ordered from YESSTYLE.COM?? It says beside some of there products that it takes 7-14 days to ship?! Yes!! I love ordering clothes and accessories from yesstyle!!! 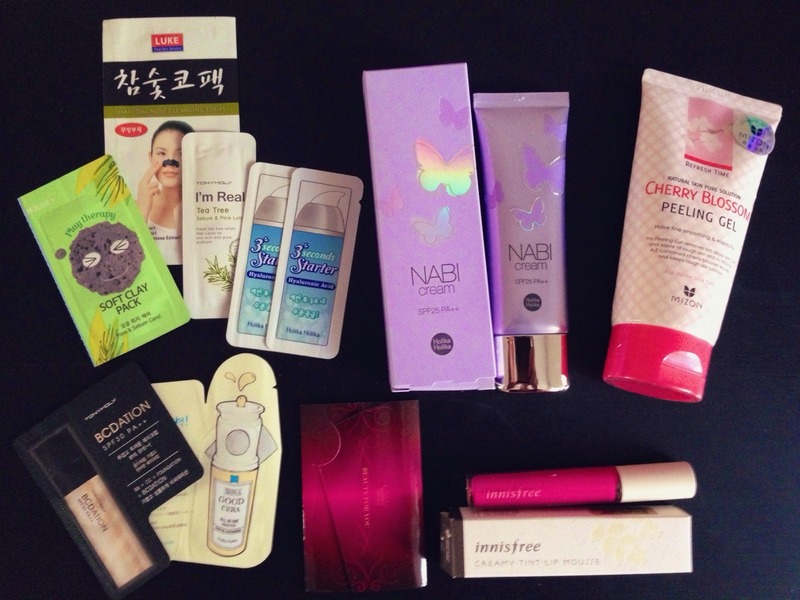 But I seldom order any skincare products, because they're more expensive on yesstyle than local online stores!!! Finaly gotten my Jolse.com order. Pic was super huge gotta spoiler it instead. I love everything and they are so generous with samples! OooOO whats that Nabi cream? Nabi = butterfly in Korean I think this is an upgraded version of Holika Holika's Miracle Finish Cream (a makeup base/cc cream that's their bestseller) because that cream has been referred as "the nabi cream" among Korean netizens! This new and officially named Nabi cream, too, acts as a makeup base i think as it comes with 3 shades - purple, beige, pink. Btw Jolse's catalog is really updated! The nabi cream has just launched in Korea and wow it's in your hands now! I need to put this here...it's SAILOR MOON EYELINER! It's made by Creer Beaute Japan, who mainly makes eye makeup. As I really wanted these items and wasn't sure they would be in any of my many meme boxes that I ordered, I placed the order! So thanks to this thread, I just bought a 3-pack of the Holika Holika Pig Nose blackhead clearing pack (a 3-step mask system) and a Tonymoly Magic Lip Tint in green apple (cause it changes colors, and I am such a sucker for a gimmick) from koreabeautynet, or whichever order the words are in . 12 bucks and change, and free shipping...but the estimate for arrival is 15-35 days. I don't mind waiting, but that's quite a range! Now I'm thinking I should have just bought more. Everything is 10% off right now, too. I know - those shipping times are killing me!! I really want my ginger & vinegar foot spray!! I do power walking at lunchtime at work and my feet need THIS! my products shipped out this morning!! yeah! I got my order from BeautynetKorea on Friday and everything arrived in perfect condition and they included tons (like maybe 15?) foil packet samples, which was awesome! I'm running low on sheet masks, so I placed another order with them today. I got the Holika Holika Pig Nose blackhead strips, Innisfree berry hydrogel masks, The Face Shop blueberry masks, Food-a-Holic masks in coenzyme 10 and orange, Skin Food peach sake essence mask, Holika Holika baby silky hand and foot masks, and two different Etude House hand masks. I'm really excited! They have a huge selection of stuff and there's so much more I want to try, but I'm going to have to work through some of my backlogged Memebox supply before buying more stuff. Were the Food-a-Holic ones the 3D ones? I really enjoy using the 3D ones, because they really do cover my face well, especially the sides of my nose!!! Plus, they're REALLY CHEAP here in Hong Kong!!! did your original shipment take about 4 weeks? or less to get to you? Mine shipped out today, so I am just wondering how long it will take. Well, for my last order, I placed it on May 2nd, got a shipment confirmation on May 9, and received it on May 23, so 3 weeks for me. Yeah, they're supposed to be 3D! Out of curiosity, how much were the 3D masks? What's a 3D mask? Do you look like a toon with them on? !